PT Bank BRISyariah - BRIS (hereinafter referred to as "BRISyariah") is a rapidly expanding financial services company in Indonesia with core business focus on sharia banking industry. BRISyariah is owned and managed by PT Bank Rakyat Indonesia (Persero) Tbk or BRI Group, the second largest financial companies in Indonesian with majority owned by the Government of Indonesia. At present, BRI Group owns a 99.999966 percent stake in BRISyariah with the remainder of the shares belonging to YKP BRI. With services in all parts of Indonesia, BRISyariah runs its business through 52 branch offices, 208 sub-branch offices, 11 cash offices, and 675 sharia service offices. In the first half of 2016 (1H 2016), in 2015, the performance of BRISyariah is showing good results. According to PT Bank BRISyariah Financial Statement 30 June 2016 as cited by JobsCDC.com, the Sharia Bank booked total net profits of Rp 90.28 billion in 1H 2016. That number is up 0.09% from Rp 60.15 billion in 1H 2015. As of the end of June 2016, BRISyariah’s assets amounted to Rp 24.95 trillion, up 15.34% from Rp 21.63 trillion at the end of June 2015. Minimum education of D3/S1 any field. The candidate with prior experience in marketing is preferred. Target oriented, honest, tenacious and hardworking. Have personal vehicle and driving license class C (SIM C). 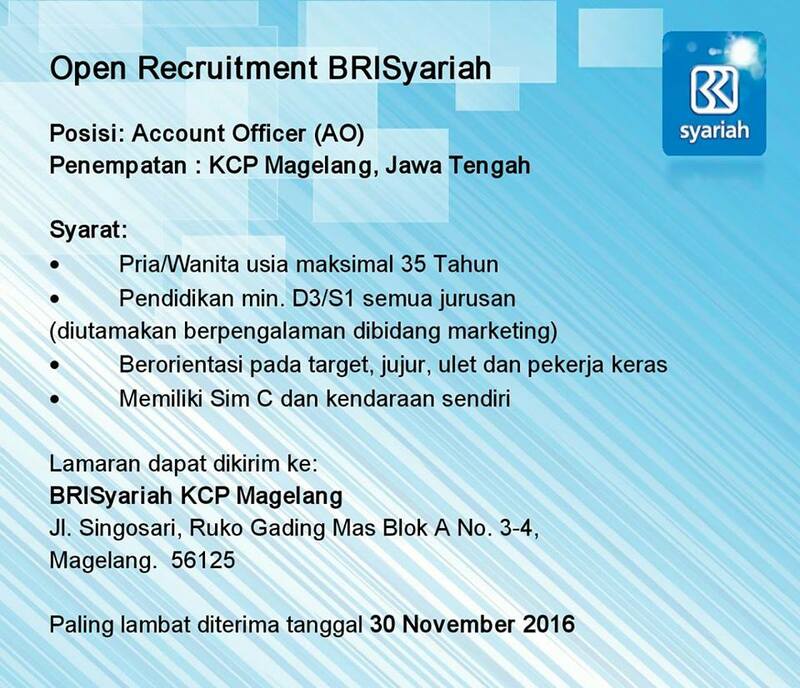 Placement at BRISyariah KCP Magelang. JobsCDC.com now available on android device. Download now on Google Play here. Please be aware of recruitment fraud. The entire stage of this selection process is free of charge. PT Bank BRISyariah - D3, S1 Open Recruitment BRI Syariah November 2016 will never ask for fees or upfront payments for any purposes during the recruitment process such as transportation and accommodation.